This article is about Russia under communist rule from 1917 to 1991. For the modern Russian state, see Russia. Not to be confused with Soviet Union. The Russian Soviet Federative Socialist Republic (Russian SFSR or RSFSR; Russian: Росси́йская Сове́тская Федерати́вная Социалисти́ческая Республика, tr. Rossíjskaja Sovétskaja Federatívnaja Socialistíčeskaja Respublika, IPA: [rɐˈsʲijskəjə sɐˈvʲɛtskəjə fʲɪdʲɪrɐˈtʲivnəjə sətsɨəlʲɪˈsʲtʲitɕɪskəjə rʲɪˈspublʲɪkə] ( listen)), previously known as the Russian Soviet Republic and the Russian Socialist Federative Soviet Republic, as well as being unofficially known as the Russian Federation, Soviet Russia, or simply Russia, was an independent state from 1917 to 1922, and afterwards the largest, most populous and most economically developed of the 15 Soviet socialist republics of the Soviet Union (USSR) from 1922 to 1990, then a sovereign part of the Soviet Union with priority of Russian laws over Union-level legislation in 1990 and 1991, during the last two years of the existence of the USSR. The Russian Republic comprised sixteen smaller constituent units of autonomous republics, five autonomous oblasts, ten autonomous okrugs, six krais and forty oblasts. Russians formed the largest ethnic group. The capital of the Russian SFSR was Moscow and the other major urban centers included Leningrad, Novosibirsk, Yekaterinburg, Nizhny Novgorod and Samara. On 25 December 1991, following the resignation of Gorbachev as President of the Soviet Union (and former General Secretary of the Communist Party of the Soviet Union), the Russian SFSR was renamed the Russian Federation, with President Yeltsin re-establishing the sovereign and independent state (see history of Russia from 1991 onwards). With the lowering at 12 midnight of the red flag with hammer and sickle design of the now former USSR from the towers of the Kremlin in Moscow on 26 December 1991, the USSR was self-dissolved by the Soviet of the Republics, which by that time was the only functioning chamber of the parliamentary Supreme Soviet (the other house, Soviet of the Union, had already lost the quorum after recall of its members by the several union republics). After dissolution of the USSR, Russia declared that it assumed the rights and obligations of the dissolved central Soviet government, including UN membership and permanent membership on the Security Council, but originally excluding foreign debt and foreign assets of the USSR (also parts of the former Soviet Red Army and nuclear weapons remained under overall CIS command as CIS United Armed Forces [Wikidata]). On 30 December 1922, the First Congress of the Soviets of the USSR approved the Treaty on the Creation of the USSR, by which Russia was united with the Ukrainian Soviet Socialist Republic, Byelorussian Soviet Socialist Republic and Transcaucasian Soviet Federal Socialist Republic into a single federal state, the Soviet Union. The treaty was included in the 1924 Soviet Constitution,[clarification needed] adopted on 31 January 1924 by the Second Congress of Soviets of the USSR. Tuva ASSR was formed on 10 October 1961 when the Tuva Autonomous Oblast was elevated[by whom?] into an ASSR. On 12 December 1990, it declared sovereignty as the Soviet Republic of Tyva. The Kazakh Soviet Socialist Republic was one of the transcontinental constituent republics of the Soviet Union from 1936 to 1991 in northern Central Asia. It was created on 5 December 1936 from the Kazakh ASSR, an autonomous republic of the Russian SFSR. Uzbekistan is the common English name for the Uzbek Soviet Socialist Republic and later, the Republic of Uzbekistan, that refers to the period of Uzbekistan from 1924 to 1991. as one of the constituent republics of the Soviet Union. It was governed by the Uzbek branch of the Soviet Communist Party, the only legal political party, from 1925 until 1990. From 1990 to 1991, it was a sovereign part of the Soviet Union with its own legislation. Sometimes, that period is also referred to as Soviet Uzbekistan. The Republic of North Ossetia – Alania is a federal subject of Russia, located in the Caucasus region. The Checheno-Ingush Autonomous Soviet Socialist Republic, or Checheno-Ingush ASSR was an autonomous republic within the Russian SFSR. Its capital was Grozny. Equal legal opportunities for all citizens, political parties and public organizations. The need to significantly expand the rights of the autonomous republics, regions, districts, territories of Russia (federalism). The Udmurt Autonomous Soviet Socialist Republic was an autonomous republic of the Soviet Union, named after the Udmurt people. It was formed on 4 November 1920 as the Votyak Autonomous Oblast and renamed as the Udmurt Autonomous Oblast in 1932. On 28 December 1934, the oblast was renamed the Udmurt Autonomous Soviet Socialist Republic, but did not become a full member of the Russian Soviet Federative Socialist Republic until 1936. 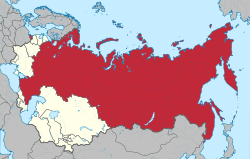 The Kabardino-Balkar Autonomous Soviet Socialist Republic was an autonomous republic of the Russian Soviet Federative Socialist Republic, in the former Soviet Union, and was originally a part of the Mountain Autonomous Soviet Socialist Republic. On 16 January 1922 the region was detached from the Mountain ASSR and the Kabardino-Balkar Autonomous Oblast on 1 September 1921. It became an autonomous republic on 5 December 1936. On 30 January 1991, the Kabardino-Balkar ASSR declared state sovereignty. It is now the Kabardino-Balkaria republic, a federal subject of the Russian Federation. The Kabardino-Balkar ASSR bordered no other sovereign states during the existence of the Soviet Union. The Treaty on the Creation of the USSR officially created the Union of Soviet Socialist Republics (USSR), commonly known as the Soviet Union. It de jure legalised a union of several Soviet republics that had existed since 1919 and created a new centralised federal government where key functions were centralised in Moscow. The coat of arms of the Russian Soviet Federative Socialist Republic (RSFSR) was adopted on 10 July 1918 by the government of the Russian Soviet Federative Socialist Republic, and modified several times afterwards. It shows wheat as the symbol of agriculture, a rising sun for the future of the Russian nation, the red star as well as the hammer and sickle for the victory of Communism and the "world-wide socialist community of states". The following is a list of leaders of Communist Chechnya, encompassing leaders of the Chechen Autonomous Oblast, the Chechen-Ingush Autonomous Oblast, the Chechen-Ingush Autonomous Soviet Socialist Republic and the Grozny Oblast. The national emblem of the Checheno-Ingush Autonomous Soviet Socialist Republic was adopted in 1937 by the government of the Checheno-Ingush Autonomous Soviet Socialist Republic. The emblem is identical to the emblem of the Russian Soviet Federative Socialist Republic. The emblem of the Crimean Autonomous Soviet Socialist Republic was adopted in 1921 by the government of the Crimean Autonomous Soviet Socialist Republic. The emblem is identical to the emblem of the Russian Soviet Federative Socialist Republic. The flag the Karakalpak Autonomous Soviet Socialist Republic was adopted in 1954 by the government of the Karakalpak Autonomous Soviet Socialist Republic. The flag is identical to the flag of the Uzbek Soviet Socialist Republic. The 1927 Constitution of the Azerbaijan Socialist Soviet Republic was adopted by the Central Executive Committee of the Azerbaijan SSR at the 5th All-Azerbaijani Congress of Soviets on March 26, 1927.